“Tulip mania” reached its height in the 1630s in Europe, with wealthy men and women spending great sums of money to acquire exotic tulip bulbs from the Middle East. More generally, there was enthusiasm for all types of rare flowers, such as marigolds, which came from Mexico via Spain. Potters in Holland created elaborate multitiered vases like this one to showcase colorful blooms. Here, the borders of scrolling lotuses, chrysanthemums, ruyi (scepter heads), and the Chinese character for longevity are copied from decoration on Chinese blue-and-white porcelain vases imported in large quantities in the 1600s. It is unlikely that Dutch craftsmen or customers knew the meaning of these motifs. This vase is an outstanding example of Dutch potters’ achievements around 1700. When Chinese porcelain imports to Europe dried up in the 1650s because of political instability in China, Delft potters stepped in to fill the breach. While the benefits of international trade are debated today, such global interaction has historically sparked creativity in the world of art, acting as a spur to innovation. 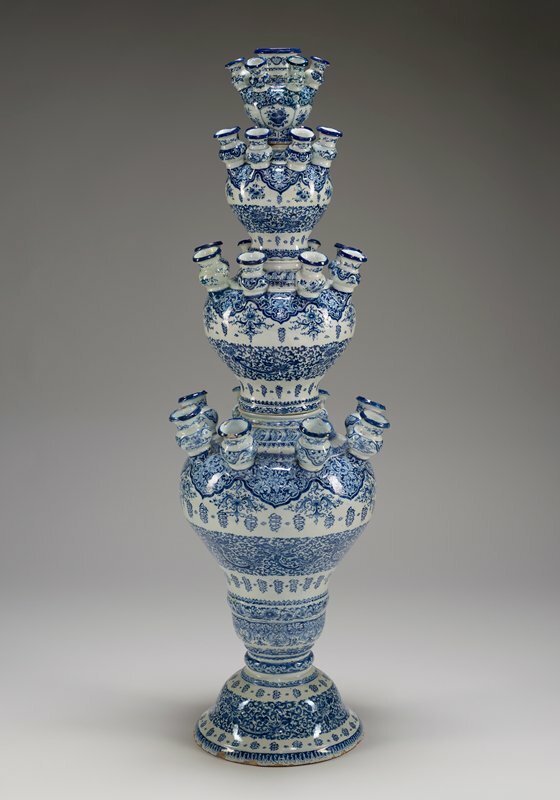 Owing to its scale and complexity, this vase is a significant addition to Mia’s collection of Delft pottery. This was one of Mia's top highlights in 2017.